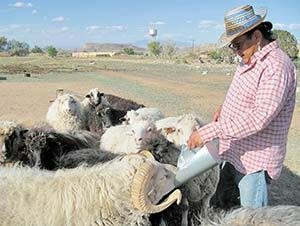 TOP: At his ranch in Teeç Nos Pos, fiber artist Roy Kady gives his small herd of churros a treat of corn. In the background is the T'iis Nazbas Community School, which dates back to the 1930s but has been rebuilt twice. 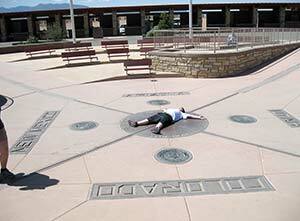 MIDDLE: A young tourist at Four Corners Tribal Park finds a way to be in Arizona, Utah, Colorado and New Mexico at the same time. Teeç Nos Pos Chapter straddles three of the four states (the Ute Mountain Utes got the Colorado corner), which sometimes makes it difficult to get state funding for projects within the chapter, since even some homesites straddle two states. 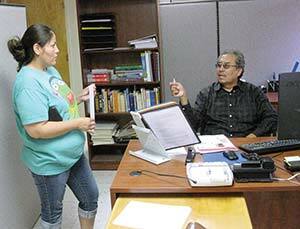 BOTTOM: Frank Todacheeny, coordinator of Navajo Technical University's new Teeç Nos Pos campus, talks with prospective student Yolanda George about the site's upcoming GED program. About 45 students are registered at the Teeç Nos Pos campus, although some attend classes at one of the other sites. Most people would say having running water is a good thing, and that includes Roy Kady. But the 49-year-old rancher also believes something was lost when he was in grade school and running water finally came to most of Teec Nos Pos. "The main spring for the community was right up there," he says, motioning up-canyon from his gorgeous spread at the foot of the Carrizos. "People would be coming past our house for water all the time. They'd bring their washtubs. The kids would be playing. There'd be clothes hanging all over the trees." Now the spring is capped; people just turn on their taps. And there's not as much water as there used to be. Kady's family used to have more than 250 sheep. Now he has 13 beautiful churros, which is as many as he feels his pasture and his energy can support. "This used to be a farming community," Kady says, looking out his window down the wash. "This all used to be planted in squash, corn and melons." Frank Todacheeny remembers those days. It was sheep, he says, that saved Teec Nos Pos from the Depression. "The people were starving," he says, "but my dad and uncles still had a lot of sheep across the river. They said, "Why shouldn't we divide up our sheep, and give everybody some, to start their herds back again?' Every now and then, an elderly person reminds me of what they did." It was that kind of a community, and maybe still is. Two years ago, Teec rallied to bring a campus of Navajo Technical University here, and now, after four decades as an educator, Todacheeny finally has a job in his hometown, coordinating the new NTU site. "I'm the custodian, advisor, finance clerk, you name it," he says. As if to underscore the point, a student stops in to complain he didn't get a refund from a canceled class. Todacheeny makes a note. "They need to get me a clerk," he sighs. "And a bus driver. We could quadruple the number of students if we had some way to get them here." But it's a good start. The campus, located in the former Head Start building plus another pre-fab structure and a nice-looking hogan built by construction students, offers math, English, computer skills, carpentry and Navajo studies, including a weaving course taught by Kady, an internationally renowned fiber artist. Local students like Kaye Larry are glad NTU is here. Although Teec is on a major highway, she says, not everybody has the money to commute an hour round trip to Shiprock, and for the students from the Kayenta area, it's even worse. Plus, she likes the fact that the new campus seems to be attracting older students. "I feel like I can learn almost as much from the other students as I can from the instructors," she says. Todacheeny, who did a shocking study of language loss among the latest generation of Diné for his dissertation, would love to beef up the Navajo studies side of things, but that's down the road. The community needs the basics, and starting this summer, the campus will offer a GED program. (As if to underscore that, a prospective student comes in asking about it.) "This needs to be the community's college," Todacheeny declares. "I'm not going to be a my-way-or-the-highway kind of guy." As a member of the community, though, he does hope the school leads to more entrepreneurship. "Look where we are," he says. "Monument Valley and the Grand Canyon are right down the road; the Four Corners (monument) is right over there. Why don't we have a motel and restaurant right at this intersection (of U.S. 160 and 64)?" Kady, who used to be the chapter president, says one reason is that Teec Nos Pos people are picky. And that's not a bad thing. "When the tribe said, ÔWe want to put a casino here,' the people said, ÔNo, we don't want that,'" he says. "I think it was the right decision for us." People have talked about bringing in a chain restaurant like a Denny's, and the community has nixed that too, Kady says. "The elders say, ÔWe want a place where we can have a pot of coffee together, not just something for the tourists,'" he explains. If it seems like the people of Teec are food snobs, well, it has served them well in the past. When British celebrity chef Jamie Oliver came through the Navajo Nation looking for authentic American recipes for his cookbook "Jamie's America," this was one of his stops. Kady butchered one of his prized churro lambs, and was amazed with the dish Oliver came up with, using locally gathered herbs (you can find "Epic Churro Lamb" on page 150). The two have remained friends, and Oliver left the community a geodesic dome greenhouse to encourage more agriculture. Teec does have a picturesque faux-adobe trading post that says right on it it was established in 1905, but that's a bit misleading, according to Kady. Name: An Anglicization of T'iis Nazbas, "Cottonwood Tree(s) in a Circle," referring either to a circle of cottonwoods that used to be a meeting place or a single tree that was trained to grow in a circle with baling wire as a sapling. Major clans: Ashiihi, Hashkaa Hadzhoho, Bit'ahnii, Tl'izilani, Tachiinii, To'Dich’inii. Famous sons: Former tribal chairman Peter MacDonald, turn-of-the-century Diné leader Judge Klah. Landmarks: Four Corners Tribal Park, Three Monkeys (Tsé Da'shii'jaai) Mesa, Twin Falls. Issues: Lack of businesses, drought, unreclaimed uranium mines, chapter house closed due to leaky roof. Assets: Navajo Technical University campus, boarding school, good development potential along major tourist highway, community spirit. Upcoming event: open house at NTU campus May 7. "It used to be down here along the wash," he says. "They moved it up on the road some time in the 1960s, I think." Teec also has some gorgeous hiking trails, established by Tom Riggenbach's YES for Diné Bikeyah when he was part of this community, including one that leads to Twin Falls and its astonishing year-round ice cone (here's an insider secret: if you're willing to hike far enough, Twin Falls is actually a triplet). Kady is working hard to gather people and pass on some of his skills as a member of Dibé be Iina ("Sheep is Life") and the Navajo Churro Heritage Lamb Presidium. He sometimes allows apprentice shepherds to stay with him and learn the tricks of the trade. At the moment an angel-faced Floridian named Caleb is busy with the ranch chores. And his home is a stop on the series of "spin-offs" sponsored by Dibé Be Iina where you can stop in, share a recipe and learn to spin, dye, felt or weave. "I think Navajo people still love to get together," Kady muses. "It's not as spontaneous as it used to be. We have to remember to invite each other." Perhaps some day Todacheeny's and Kady's students will graduate and gently develop some eco-tourism and a fantastic locavore restaurant at this gifted crossroads chapter that straddles three states and eyes the Utes across the San Juan in Colorado. Until then, the tourists whiz by on 160, stopping just long enough at Four Corners Tribal Park to snap photos of each other straddling four states ... never knowing what they're missing.